I have always believed in hard work, especially when it comes to my career and definitely when it comes to my cooking. Where I may have had a shortcoming is with my eating....I'm sure you're all aware at this point that I LOVE FOOD! And, not just the actual food, but the concept, the presentation, the creamy, savory, mouth watering, delectable, chocolatey, salty, rich, doughy, can't wait till the next bite amazingness of a good meal and a perfect bite that puts a smile on your face and sometimes a little twinkle in your eye. So...I love food and everything about it. Where I can have an issue is putting the fork down sometimes. It's so good, I always want more. This isn't a struggle to me alone, I know. That's why concepts, like The Biggest Loser, is born and ends up working it's way into my work life. So, willingly I signed up to lose what I can. Which means, the loveliness of some of the AMAZING desserts I have on here have not been made for a while and why recipes like this Grilled Romaine Salad will show up a little bit more over the summer. While the contest is only going through June, I would like to switch some stuff up and grow my culinary knowledge by challenging myself to create more which will NOT give up taste, but may be on the healthier side. Things I promise you (and myself): 1) I am not starving myself; 2) I will NEVER cut anything out of my diet entirely - MODERATION; & 3) I will never get rid of BUTTER - I love the stuff and the alternative (Marg) is not in my wheel house. Working with the grill to switch up a little of the usual salad is just one of the ways to make healthier choices a little more fun on a daily basis. And if you are already grilling for the night, it's really easy to just throw these romaine halves right before everything else is done. Grilling the romaine gives a crunch and adds a smokiness and some summer fun. Cut romaine hearts and roma tomatoes down the center length wise. Rise under cold water and dry on paper towels. 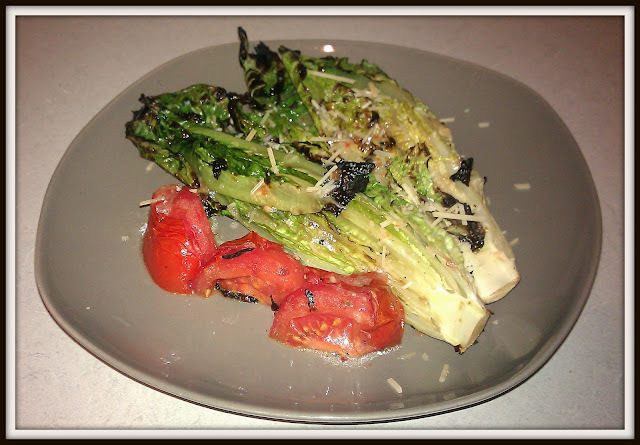 Drizzle Olive Oil over the cut side of the romaine and tomatoes and sprinkle with sea salt. Grill cut side down on a clean grill for about 3-5 minutes. Let cool slightly. Add dressing and sides as you would like and serve.